Most Employee Assistance Programs look the same on the surface, with a predictable set of services that all claim to meet your precise needs, when in fact, they deliver very different results. The current practice for many EAP providers is to sell you what you want, then deliver a program that falls short. Some providers have even given EAP’s a bad name with low employee participation rates and cookie-cutter approaches to individual problems. You need an EAP that both resolves your employees’ emotional issues and meets your bottom line goals. We feel your pain—so we’ve created an EAP that is unique among service models and provides meaningful results at the end of the day. Our participation rates are double the national average, and we resolve most of the employee’s / family’s issues within our EAP, providing fast assistance while avoiding expensive healthcare claims costs. We deliver measurable results. Through Ulliance’s Resolution EAP Model, 94 percent of employees and their families experiencing work-life, substance abuse and other emotional difficulties, are managed within our EAP. By using our unique, solution-focused, short-term counseling process your employees don’t need to be referred out beyond the EAP to expensive counseling through their healthcare plan, resulting in lower employer healthcare claims costs, and no out-of-pocket expense for employees. 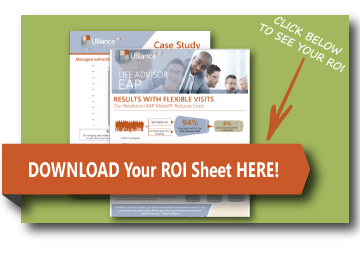 At Ulliance, our Life Adviso r EAP is designed for complete customization and to deliver bottom line results. We get to know your organization, employees and challenges, and create a program that perfectly matches your current people and ROI needs and is ready to adapt with agility to the inevitable changes that every organization undergoes. Not all EAPs are the same, which is why you can’t just compare services – you have to compare results. There are two ways you can approach selecting an EAP: as a consumer who only expects to receive a minimum service or as an investor who expects to receive a return. With the Ulliance Life Advisor EAP, the smarter you invest, the more you gain. Why Choose Ulliance as Your EAP Partner?